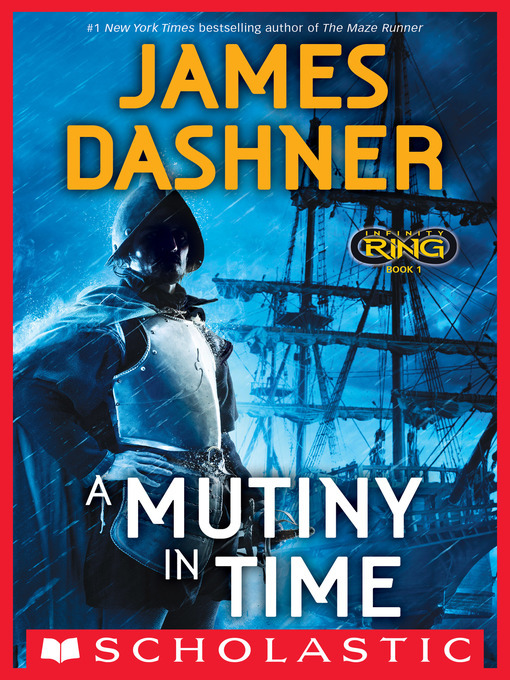 The item A mutiny in time : Infinity Ring Series, Book 1., James Dashner, (ebook) represents a specific, individual, material embodiment of a distinct intellectual or artistic creation found in Charlotte Mecklenburg Library. Scholastic's next multi-platform mega-event begins here!History is broken, and three kids must travel back in time to set it right!When best friends Dak Smyth and Sera Froste stumble upon the secret of time travel &#8212; a hand-held device known as the Infinity Ring &#8212; they're swept up in a centuries-long secret war for the fate of mankind. Recruited by the Hystorians, a secret society that dates back to Aristotle, the kids learn that history has gone disastrously off course.Now it's up to Dak, Sera, and teenage Hystorian-in-training Riq to travel back in time to fix the Great Breaks . . . and to save Dak's missing parents while they're at it. First stop: Spain, 1492, where a sailor named Christopher Columbus is about to be thrown overboard in a deadly mutiny! A mutiny in time : Infinity Ring Series, Book 1. Infinity Ring Series, Book 1.